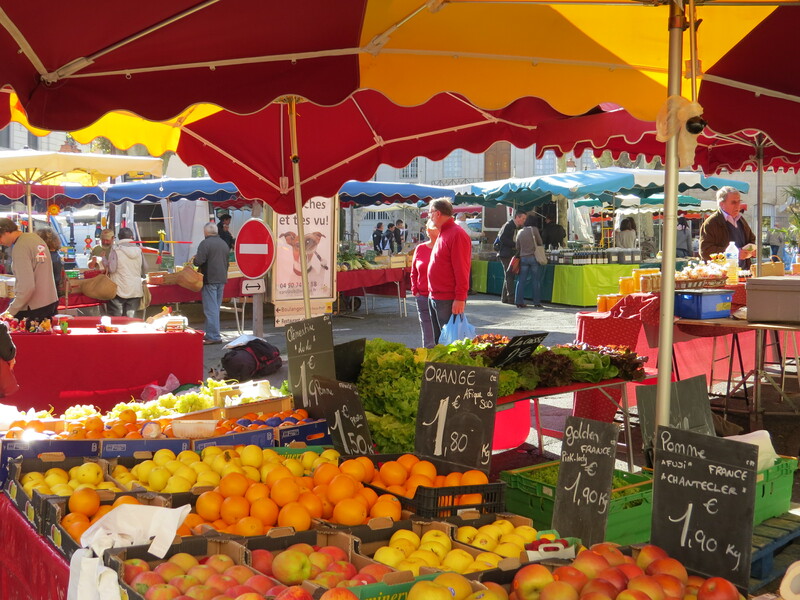 The weekly Saturday morning market in Apt has taken place since the Middle Ages, and is considered an outstanding market and one of the best in the region. The atmosphere, quality and range of the products are superb. A kaleidoscope of colours and fragrances tempt shoppers and passers-by as they wander through the streets of the historical centre of Apt. 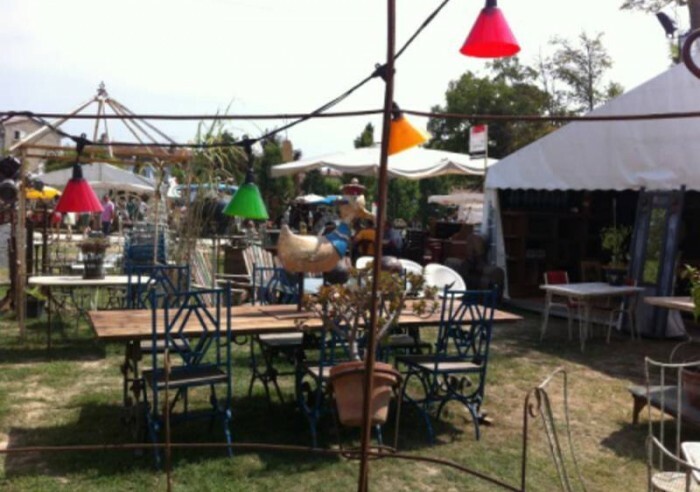 At the market stands, you will find local produce and products, food, flowers, herbs, soaps, clothes, fabrics, table cloths, baskets, musicians, and more. Many shops along the market also stay open or have stalls on the pavement, adding to the selection of goods. 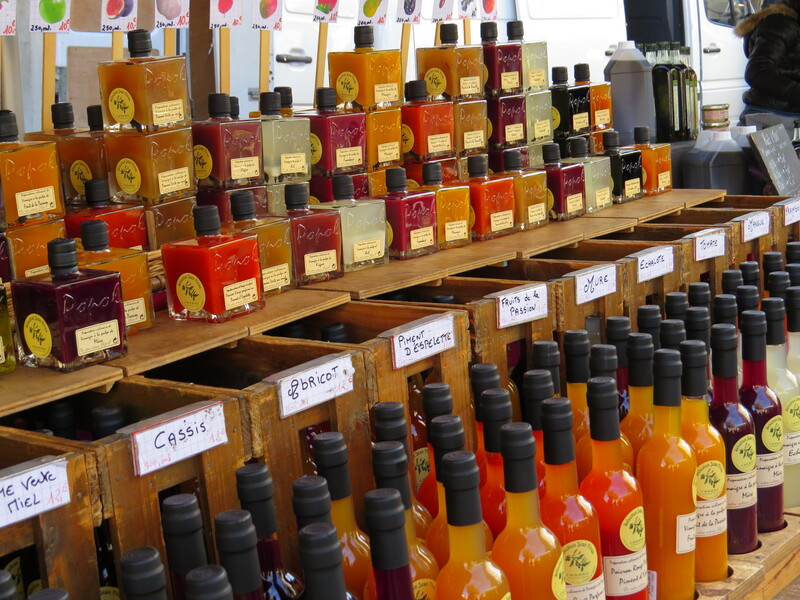 We love to discover local artisans and specialty producers at the markets. At the Apt market, we we found a fabulous selection of fresh wild Cèpes mushrooms that are in season in the fall. Their French name cep comes from the Gascon word for ‘trunk’, referring to the mushrooms’ thick, creamy stem. Their Italian name porcini however translates as ‘piglet’ and refers to the little, plump, spongy cup which has mild, nutty notes. Cèpes mushrooms are quite large and one of the most flavourful mushrooms making them a sought after delicacy and a favourite of French chefs. They have a delicious hearty rich flavour with the perfect combination of earthy and sweet taste. Cèpes also retain nearly all of their taste when dried, making them one of the most versatile varieties found in many French and Italian dishes. Watch for an upcoming post about how to prepare cèpes mushrooms & some recipes. Also at the Apt market, we sampled foie gras produced by a charming gentleman from Gers in the Midi Pyrenees region of SW France, who has a farm and has been raising ducks and producing excellent foie gras for decades. The market sprawls and swirls through several alleys and squares in the heart of old Apt, which is centered around the 11th-century Cathedral, on what was once an island between two branches of the river Calavon. Two ancient towers, the 18th-century Bouquerie tower and the 16th- century Tour de l’Horloge both have beautiful campaniles. 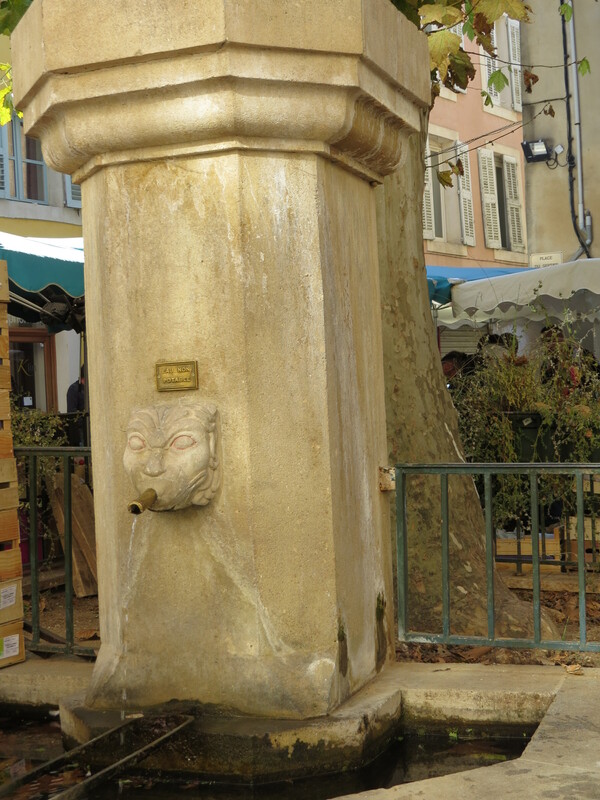 In some of the narrow, paved streets you’ll see vaulted passages and some very lovely fountains. In the village, we discovered a fascinating shop & atelier where beautiful handmade marbled faience pottery is made in the traditional methods established in Apt in the 18th century. The elderly gentlemen explained the ancient technique passed down from generation to generation, and took us through the atelier to show us samples of pottery pieces in progress. The mixing of coloured faience with yellow and red ochre and other natural pigmentations (manganese and cobalt) is covered by a light film of transparent glaze to bring out the veins and the enhance the marbling to create depth and movement. We really enjoyed our visit to the Apt market. 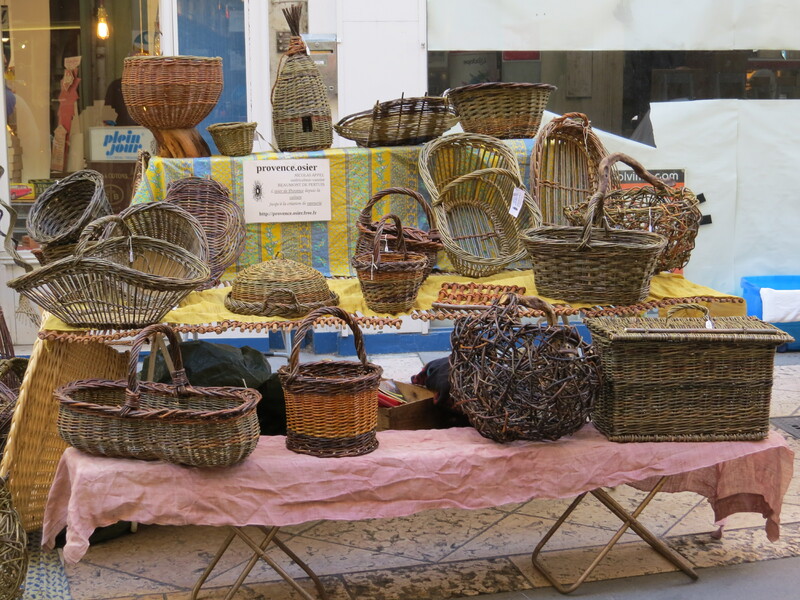 It is one of the biggest weekly markets in Provence, and has been going on for some 900 years. 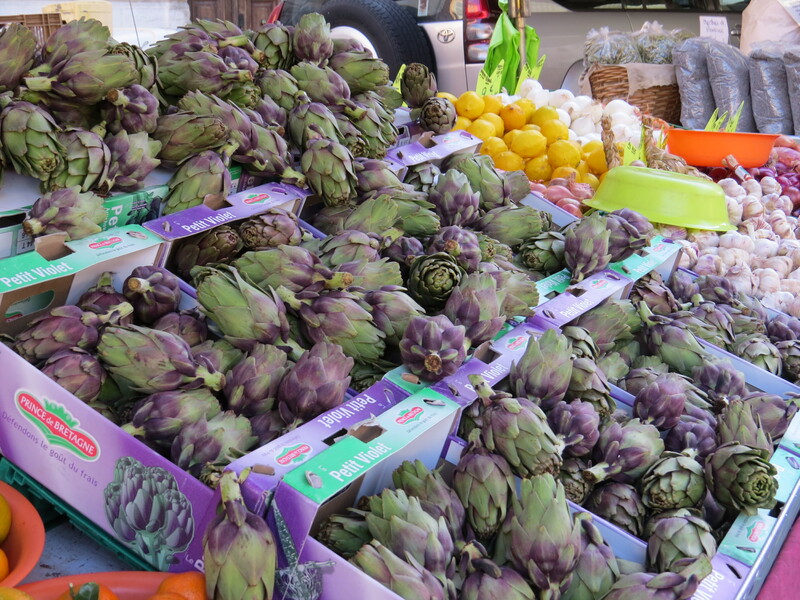 The market is definitely worth a visit, and takes place on Saturday mornings until about noon, year round. 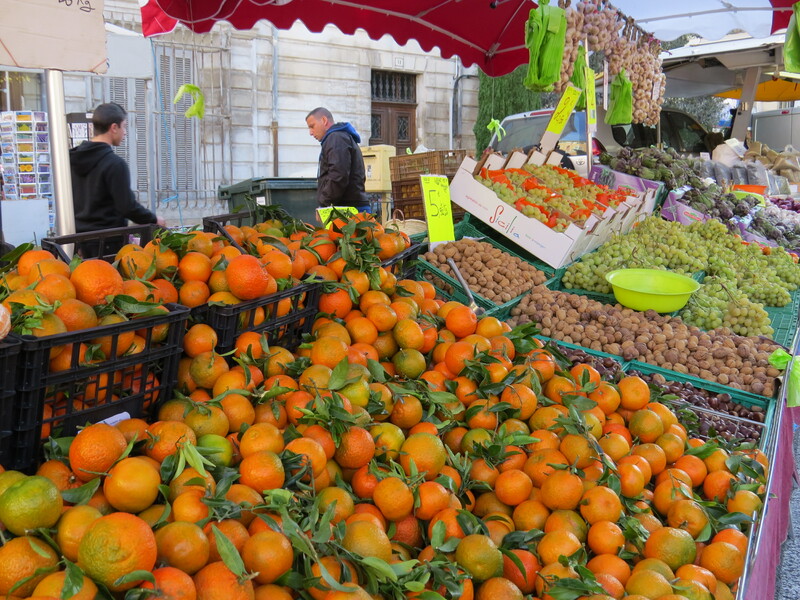 This entry was posted in Activitites, Food & Wine, Villages & towns and tagged Apt market, Cèpes mushrooms, Luberon, markets in Provence, Provence, Provence villages, southern Luberon on November 11, 2014 by franceboundblog. 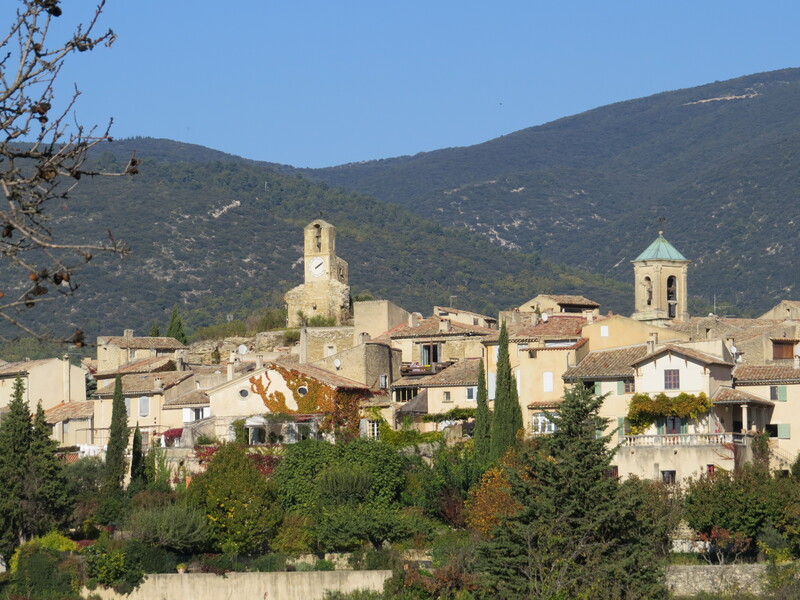 The village of Lourmarin lies in the southern Luberon valley, at the base of the Luberon range and sheltered from the Mistral winds. 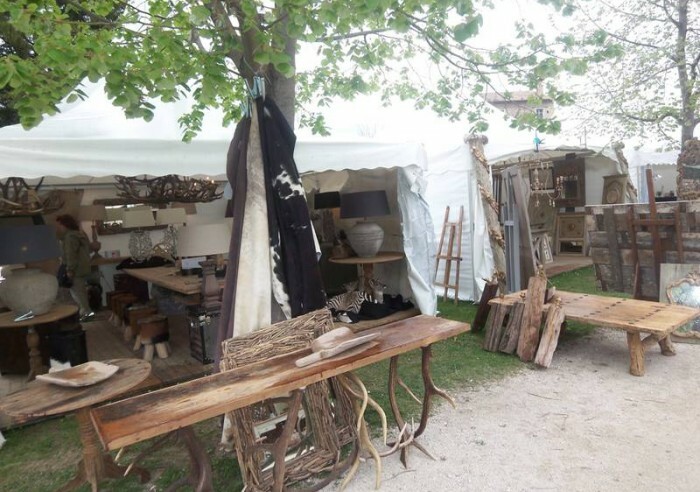 Lourmarin is one of the loveliest villages: it has a special art de vivre, charming boutiques, art galleries, cultural sites and a beautiful Provençal market, which are all reasons why Lourmarin is so popular for visiting and living. This perfect Provencal village is one of our favourites. 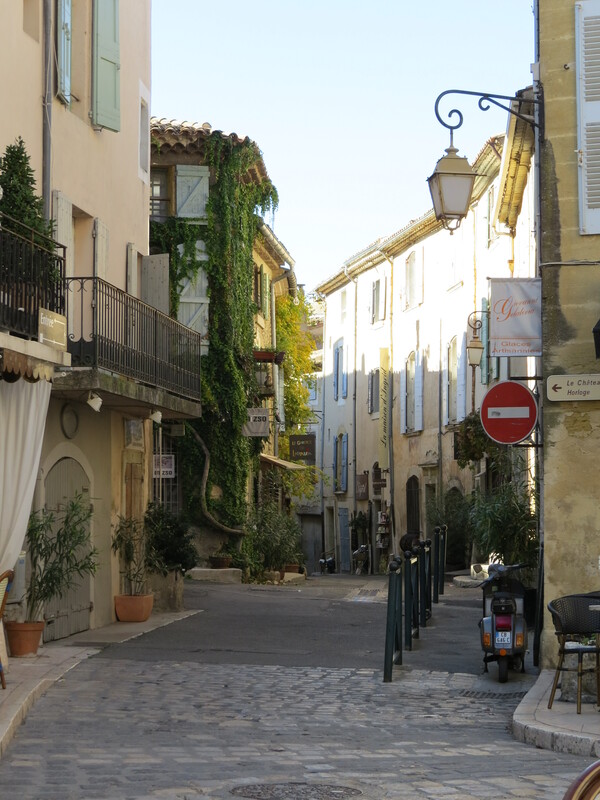 The village is filled with outdoor cafes and restaurants spilling out onto the cobblestone streets throughout the village – a fabulous place to spend a morning or an afternoon enjoying the sunshine and the Provencal lifestyle. 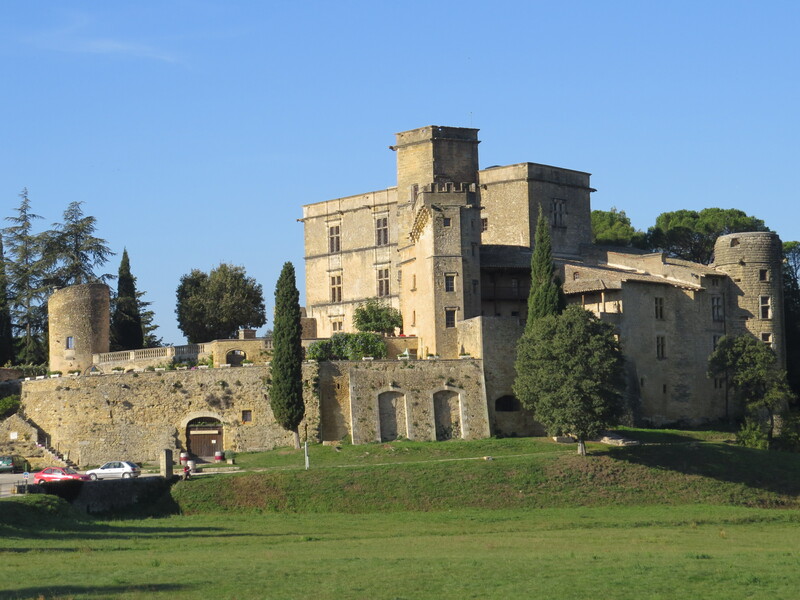 The beautiful Renaissance castle is worth a visit and is surrounded by beautiful green fields, The impressive belfry Castelas stands at the highest point of the village, and is built on the remains of the medieval moated castle that once dominated Lourmarin. 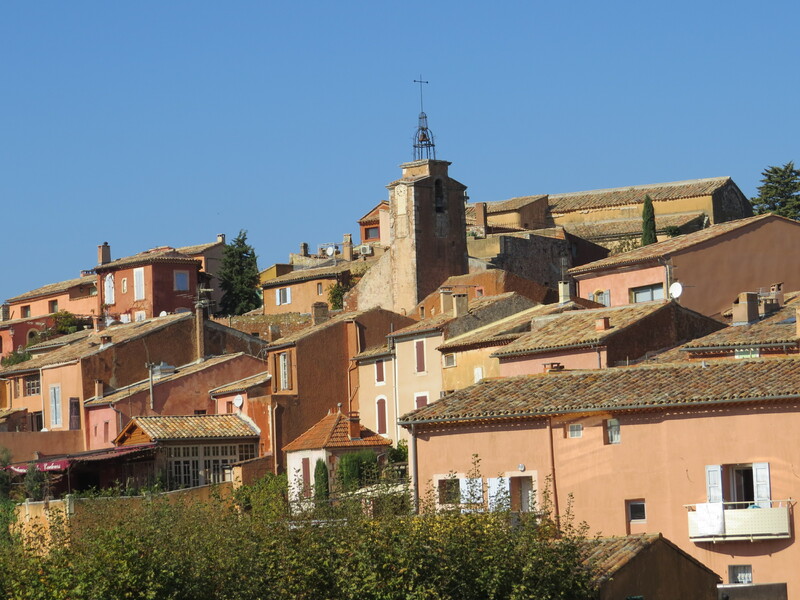 Many artists lived and worked In Lourmarin, including the Nobel prize-winning French author Albert Camus, whose L’Etranger is one of the great novels of the 20th century. 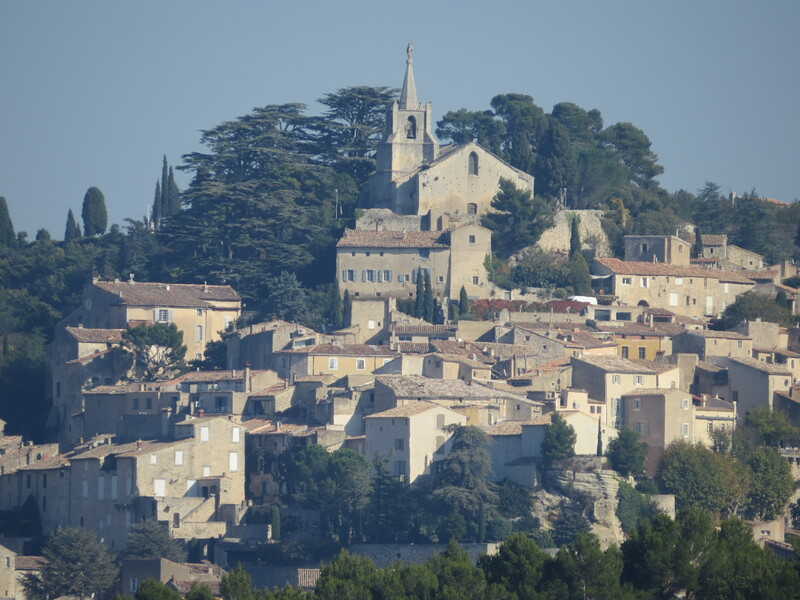 Albert Camus is buried in Lourmarin cemetery and has a street in Lourmarin named after him. There are lots of pretty cobblestone streets and walking paths winding into the village, where you will find lots of charming boutiques. 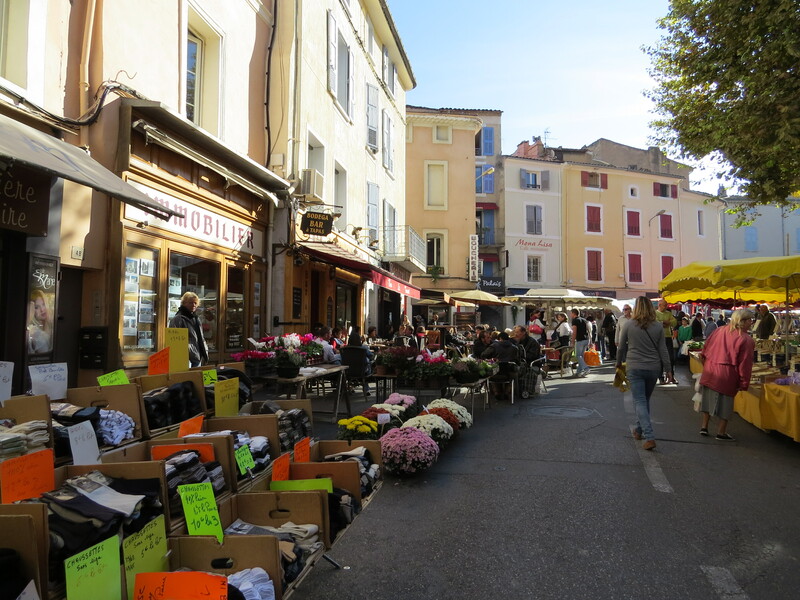 Lourmarin has a market every Friday morning, which fills the main street leading into the village. It is a good sized market and one of our favourite in the area. 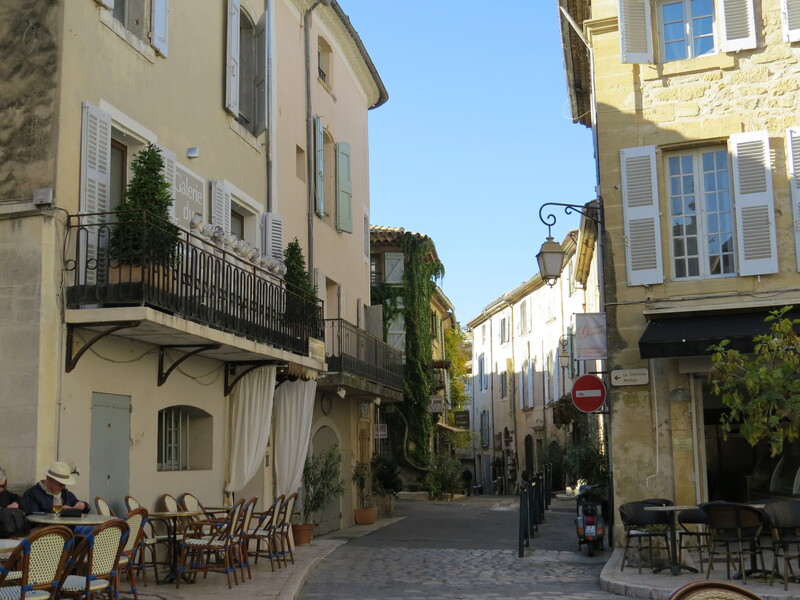 During our week in the Luberon, we had coffee or lunch several times in Lourmarin at the outdoor cafes in the beautiful late October sunshine. We had great salads at L’Insolite and Chez Gaby on the Place de la Fontaine. 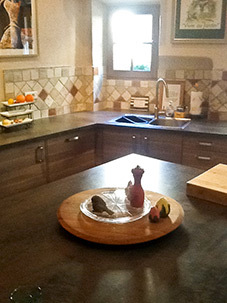 The Michelin starred chef Reine Sammut has her famous gastronomic restaurant and hotel – the Auberge la Fenière, in Lourmarin. And we enjoyed a lovely Sunday afternoon lunch with friends at the newer Bistrot, which was excellent. Highlights were the peach and grapefruit cocktail, and the seabass served with a caper, olive and tomato sauce – delicious. 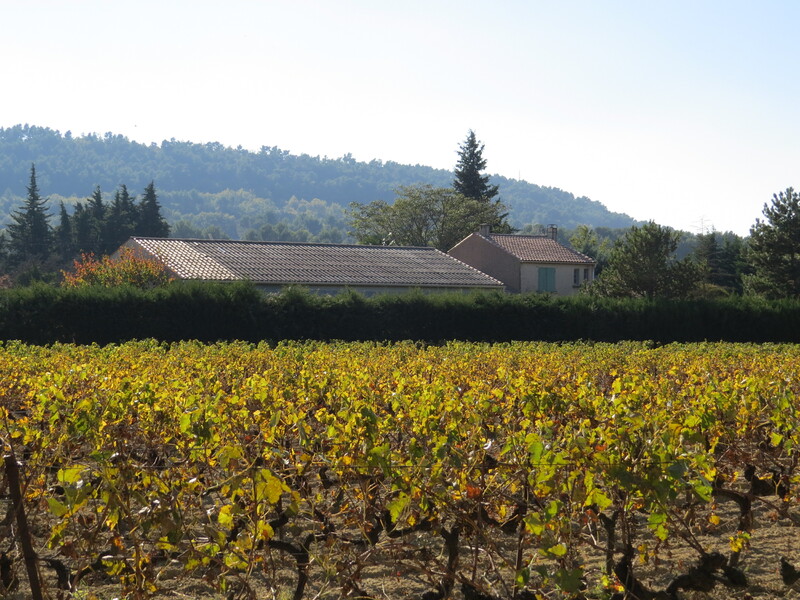 This entry was posted in Activitites, Food & Wine, Villages & towns and tagged Luberon, markets in Provence, Provence, Provence restaurants, Provence villages, southern Luberon on November 3, 2014 by franceboundblog. 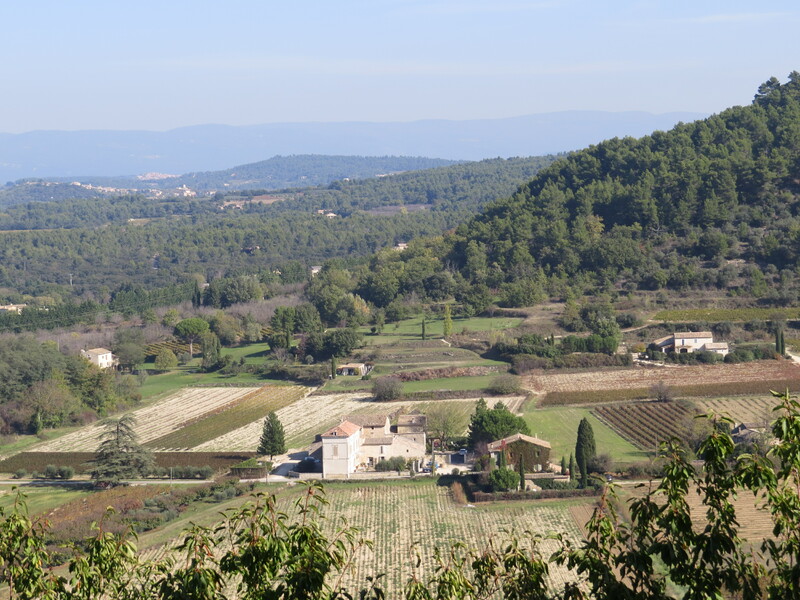 Rising above the valley, Bonnieux appears on the hillside after the last curves in the road, which is the passage-point for crossing the massif Luberon dividing the northern and southern Luberon. The road winds back and forth through the hills and up into the village of Bonnieux – a popular ride for cycling enthusiasts. 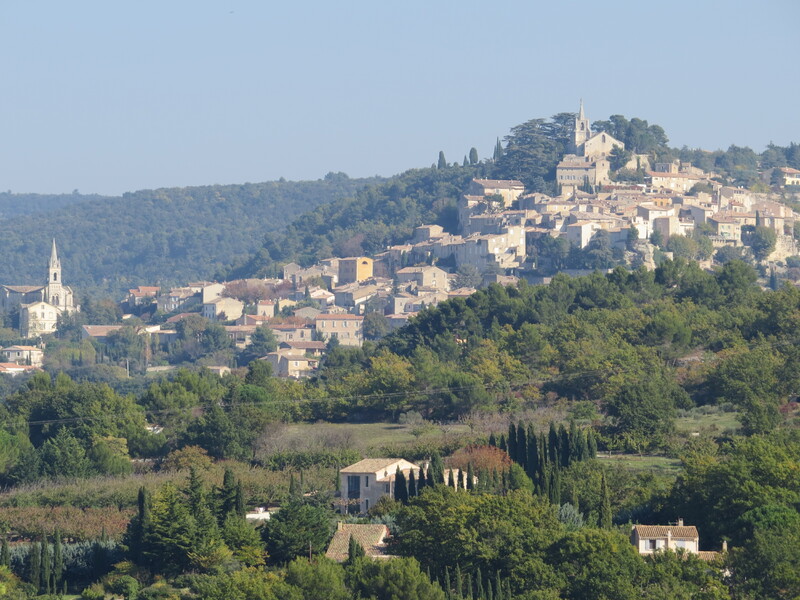 In the village, the views of the surrounding valley are superb, with a patchwork of vineyards and orchards, and also across the Vaucluse plateau to the equally picturesque perched village of Lacoste. 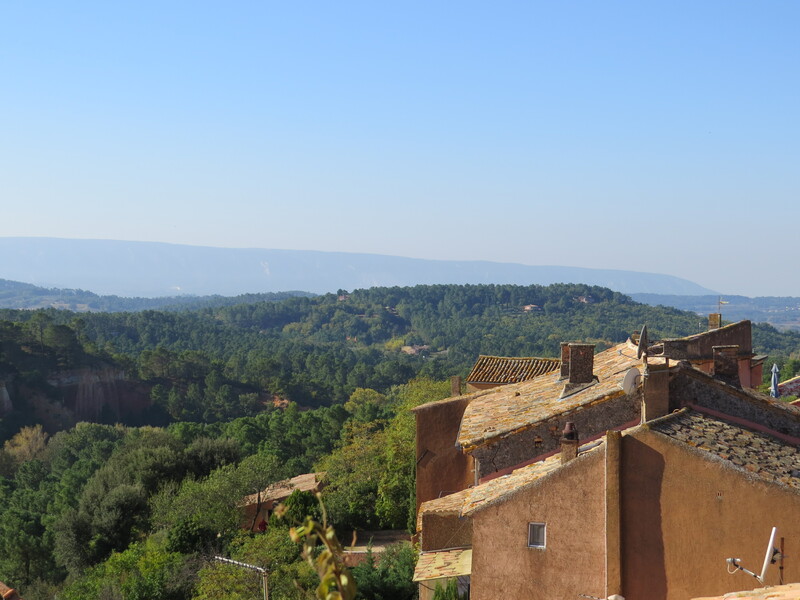 In the village you can walk up through the narrow streets of the village passing through arched tunnels beneath the houses, and up 86 steps to the top, where you can discover the 12th-century “Eglise Haute ” church with a high, pointed steeple, and take in the spectacular views. 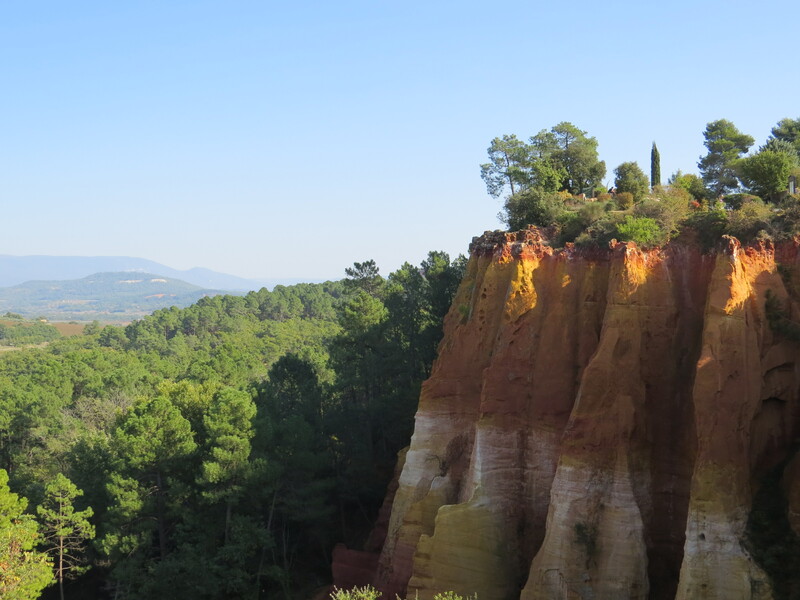 Past the end of the high church, there is a lovely little park with lush green grass shaded by tall pine trees and magnificent centuries old cedars with a view of the gorges cutting through the Luberon to the south. 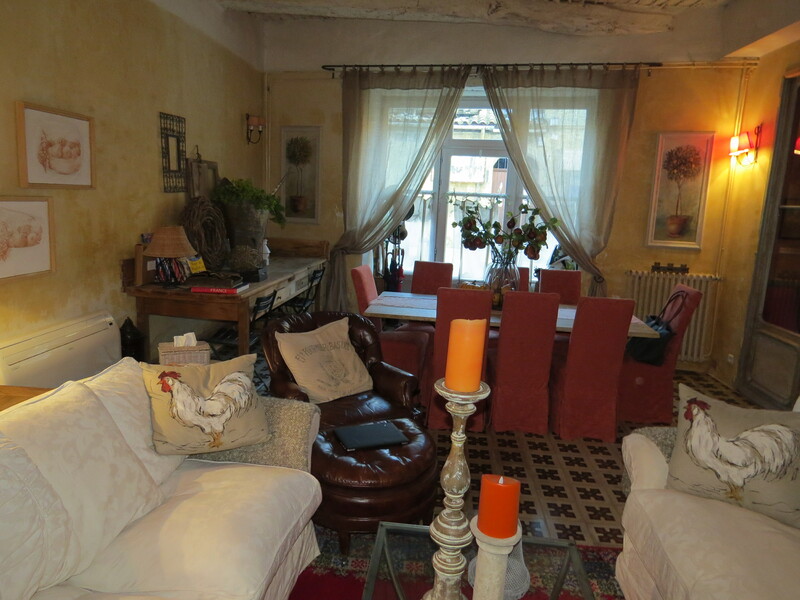 The Musée de la Boulangerie is located in the village in a 17th-century house. The museum explains the history of bread, from Roman times through Medieval and the French Revolution. Explained is the entire sequence of bread making, from the agrarian civilizations and their farming equipment, through the milling to the distribution. The museum is open in the summer, daily except Tuesdays. In the Spring and Summer the museum is on weekends. 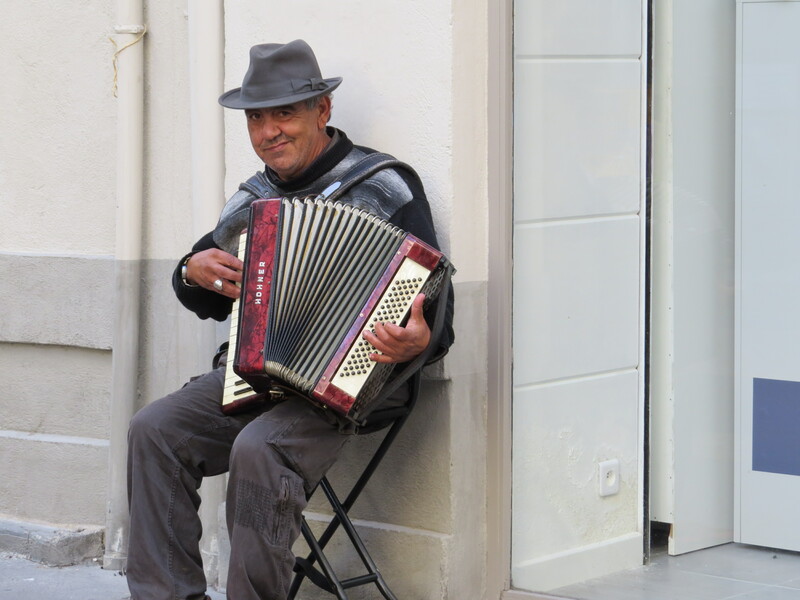 This entry was posted in Activitites, Villages & towns and tagged Bonnieux, Luberon, Provence, Provence villages, southern Luberon on November 3, 2014 by franceboundblog.